Evolutions Medical Spa’s Educational Event last week addressed skin pigmentation and how to “correct” hyperpigmentation concerns. If you have pigmentation concerns, there is no better time than now to address this! Often pigmentation correction may take more than a single treatment so plan ahead, especially if you have a special event in the future that you may want your skin to look glowing and perfect for! Evolutions always extends a complimentary consultation for further questions and information. Fill out our online consultation form or call 805-687-0212 to schedule an appointment. Melanin in the skin causes pigmentation – that varies by an individual’s skin color (darker skin has more melanin, lighter skin has less). 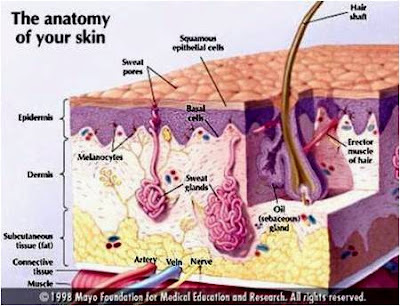 Melanin is produced for protection in response to sun exposure (for example, a sun tan is really an “injury” to the skin), trauma, inflammation. Melanin can be influenced by hormones, birth control pills and pregnancy (the “mask of pregnancy” often appears as melasma, darker spots, on the cheeks). What if Melanocytes are Over-Stimulated? 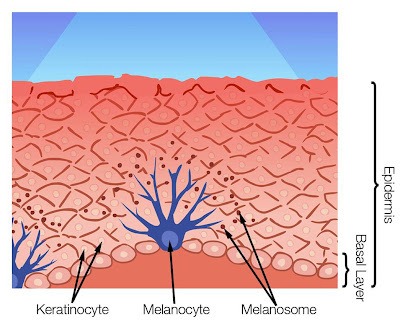 Appearance problems of the skin occur when melanocytes are over-stimulated. This hyperpigmentation is commonly referred to as brown spots, age spots, liver spots, and/or sun damage. Post-inflammatory hyperpigmentation can also occur from pimples. Melasma – a broad patch of pigmentation – can occur and can be in the epidermal or dermal layers of the skin. Epidermal pigmentation is more readily treated because of the location – the outer-most layer of the skin. Dermal region pigmentation can be more stubborn to treat. At Evolutions, we use a Wood’s Lamp – a diagnostic dermatology tool – to look at a client’s hyperpigmentation location to find a treatment best suited for them. Hyperpigmentation Prevention: Use Your Sunblock Daily! Before we address pigmentation correction treatment options, we want to stress that prevention is key! Santa Barbara cosmetic surgeon Dr. Terry Perkins recommends using a sunblock that is at least SPF 30 and is a physical block – one that contains titanium dioxide and/or zinc oxide. Physical sunblocks reflect the sun’s energy whereas chemical sunscreens heat the skin up. Dr. Perkins and the Evolutions staff recommend to clients a highly effective sunblock called TIZO3 SPF 40. TIZO is free of paraben, oil, PABA and fragrance. It gives the skin superb protection while leaving the skin with a silky, smooth, matte finish. TIZO products are available at Evolutions. Home Care: There are many skin lightening agents on the market that are available at your local drugstore or through a physician’s office. Dr. Perkins recommends the Obagi Nu-Derm or Obagi-C Rx programs, PCA Brightening Therapy, NIA 24, and retinoids (also known as “Retin A” or “tretinoin”). Another home care option, maybe in addition to a skin brightening/lightening agent, is to increase cell turnover through products with alpha hydroxy acids (AHA), amino fruit acids, and, again, retinoids. Chemical Peels: a chemical peel is a “controlled” injury to the skin that creates enough injury to cause an exfoliation. Evolutions offers chemical peels in different strengths, depending on your overall goal and the amount of downtime you may have to dedicate to the process. Read more about chemical peels, what they can do for you, and the types that are offered at Evolutions in a previous blog post dedicated to them. Vibraderm: a superficial exfoliation using abrasive aluminum paddles that provides a gentle abrasion that is faster than microdermabrasion and does not have a vacuum component (which can cause broken capillaries). Great in a series or with in conjunction with other procedures as it will improve the penetration of treatment products and chemical peels. FotoFacial RF™: an Intense Pulsed Light (IPL) treatment with a broad spectrum of light that gives the FotoFacial RF™ the ability to treat different parts of the skin as the light is absorbed at different levels. The FotoFacial RF™ significantly improves your skin texture and appearance by reducing redness or rosacea, age spots, sun damage, spider veins, fine lines, uneven pigmentation and large pores. It is not a treatment for wrinkles. Your skin may be pink on the day of treatment but other than that, there is little down time. Sublative Rejuvenation: the newest fractional resurfacing device on the market that uses radiofrequency and can treat any skin color. It can treat mild to moderate wrinkles, brown spots, and can improve the appearance of acne scars and textural irregularities. There is less discomfort with this newer treatment in comparison to the older Matrix RF treatment and the down time is not as long. Chemabrasion: this treatment is done at Cosmetic Surgery Center by Dr. Perkins. It combines a mid-dermis peel with dermabrasion. For more information on chemabrasion, set up a consultation with Dr. Perkins at Cosmetic Surgery Center, 805-563-0000. Every person is unique and so is their skin type and pigmentation issues. If you are interested in receiving a personalized pigmentation correction plan, schedule a complimentary consultation at Evolutions by calling 805-687-0212. We would be happy to customize a treatment plan for you! Evolutions Medical Spa Santa Barbara hosts events to educate clients and guests on select topics. The Evolutions Educational Event held this past Wednesday was titled “From Red to Ready” and addressed how it is possible to get rid of acne and rosacea! Since so much information was offered, this post is dedicated to rosacea. Click here to view the post that recapped the acne presentation. Rosacea is not acne. It is a skin condition that produces facial redness and blemishes, similar to acne. How do we know the difference between acne and rosacea? 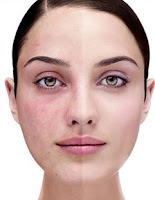 Rosacea has no underlying bacterial growth, whereas acne does. Like acne, there is no “cure” but there are ways to maintain rosacea. FotoFacial RF: the safest and most effective intense pulsed light (IPL) therapy treatment today, the FotoFacial improves skin texture and appearance through reducing redness in Rosacea. At Evolutions, we have seen clients who have been through a series of FotoFacial treatments where the Rosacea has almost completely gone away. Laser Genesis Skin Therapy: often referred to as a “laser facial”, the Laser Genesis stimulates collagen growth and reduces redness by gently heating the upper dermis, another tool to use against Rosacea. Dr. Perkins highly recommends a FotoFacial / Laser Genesis combination to effectively put Rosacea into remission. Antibiotics: tetracycline antibiotics can help quiet Rosacea. Surgery: this can be done to tackle the skin thickening that sometimes occurs in later stage patients. Usually the thickening is around the nose and surgery will peel back the layers to bring the nose back to more of it’s original form. Cosmetic surgeon Dr. Perkins offers complimentary consultations about rosacea. Call Evolutions Medical Spa at 805.687.0212 to book your rosacea consultation today. 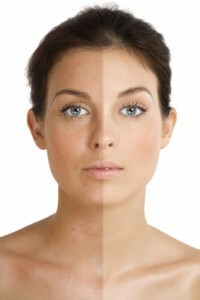 Education at Evolutions Medical Spa: Concered About Sun Damage, Age Spots, Pigmentation? * Therapeutic home care that can brighten your skin little by little every day!